This constitutional mandate provides the Ombudsman Commission with its mission. vision to lead and promote good governance and leadership. complaints against government bodies in accordance with the Organic Law on the Ombudsman Commission. formerly been administered by the Complaints Administration and Investigation Division (CAID). Relations Programs (ERP) consolidating them into one Office within the Division. mental bodies in addressing grievances from the public in a timely manner. by the Secretary and Activity Management Teams by line Managers. support the Commission advanced further to extend its institutional strengthening activities and projects. Sangetari’s appointment for a period of six years with effect from 15 November 2007.
the Department of Justice and Attorney General immediately before her appointment as Ombudsman. who served as an Ombudsman from 1 March 1982 to 8 October 1986. Ombudsman was given exceptional praise. that have demonstrated outstanding courage and leadership in fighting corruption. Togolo, Richard Kassman, John Nongorr and Dame Meg Taylor who started the TIPNG ten years ago. John Nero and Ombudsman Phoebe Sangetari. completed a Diploma in Police Science at the University of Papua New Guinea from 1974 to 1975. Mr.
and is an active member of the Certified Practising Accountants, CPA PNG. discriminatory practices by any person. Law on the Ombudsman Commission and the Organic Law on the Duties and Responsibilities of Leadership. secrecy provisions of the Income Tax Act and the Customs Act have to “give way” to the summons. • the Chairman of the Permanent Parliamentary Committee on Appointments. like other Leaders, are themselves, subject to the Leadership Code. Parliament on the operation of the Commission every twelve (12) months. The Commission has three primary functions outlined below. 1 Power to make special references to the Supreme Court on questions Constitution, Section 19. 2 (Implied) power to protect and enforce Basic Rights and Constitution, Section 57.
position or engaging in another calling. hidden influences. Political Parties and Candidates. Services Commission. Legal Services Commission. 6 Power given to Chief Ombudsman to participate in the appointment of Constitution Section 190(2)(e). Public Services Commissioners’ Appointment Committee. ated bringing the number of Senior Executives to five. degree from the University of Papua New Guinea. Commission for five years. He holds a Bachelor of Law Degree from the Bond University in Gold Coast, Australia. Kamburi, was appointed to oversee the administrative roles of the Division. Director, Mr. John Toguata was appointed to take charge of the Division. offices in the service of the Commission. of partial implementation of the new structure and hence a heavy recruitment drive to fill the vacancies. Investigations Division (CAID) and Deputy Director Leadership to Director CAID and Director Leadership respectively. incumbent Director Operations was confirmed to the position. vacancies were advertised in July 2007. Those who were made redundant were listed for retrenchment. A total of 21 vacancies were advertised and sixteen (16) positions were filled through the months of September to December 2007.
vacancies to be filled in 2008.
ment that is based on merit. the sixteen positions, nine were females and seven males. The balance of five (5) positions was not filled for technical reasons. greatly affected. Training slowed down with major focus and attention on the recruitment drive to fill the 21 vacancies. Twinning Program and Victorian Bar Readers Course for Lawyers. The two programs are funded under the Developmental Budget. and Clerical Support and Admin Officers. The Commission’s Records and Archives Management System have been used as a pilot project for the rest of the LJSP Agency. More work is still required during the course of the year. Canberra has been growing stronger every year and venturing into new areas. and Administrative and Investigations Division (CAID) in investigations and complaints handling. disciplinary forces heads in Papua New Guinea and in Australia. Disciplined Forces in Port Moresby in September 2007 which observers viewed as very successful. placement officers on how the disciplinary offices in Australia and the Commonwealth Ombudsman cooperated to fight corruption. focus to the major recruitment drive on the filling of the 21 vacant positions identified under the restructure. CHRIS skills for officers in the Finance, Information Technology and Human Resource Units. matters and a whole range of staff matters. load from the officers within the Unit ensured that staff matters were attended to within reasonable time. and wages for the Commission employees is paid in a timely manner. total assets of K6,118,104.63. Disposals during the year amounted to K157,134.00. software for on-going monitoring and management of Internet and Email service. initial requirements of a website and the upgraded CHRIS21 (Payroll and HR) Application and applied 2008 tax update. Moresby, Mount Hagen, Lae and Kokopo. in the work of governmental bodies. The Constitution ensures that governmental bodies are responsive, efficient and effective in carrying out their statutory functions. its citizens against abuse by government agencies and departments. This was a profound vision of our forefathers who planned and wrote the Constitution. Commission. This Organic Law is also used for a discriminatory practices investigation. investigate a complaint or not. tive, in addition to conducting investigations in response to specific complaints that it receives. jobs properly. The wider purpose of the existence of the Ombudsman Commission has a clear conceptual basis in the Constitution. ior Investigators in each team will be a legal officer. Commission along with the Leadership Division as it relates to the enforcement of the Constitution and the two Organic Laws. of the target for the year. discipline and morale problems within the RPNGC that had destroyed community confidence and trust in the Constabulary. Police investigation into the complaints made by the public against their members’ action and inaction. integrity will be enhanced resulting in increased confidence and trust in police by the community. cover the rest of the provinces in the country in 2008.
have been possible without the Ombudsman Commission combined oversight initiative. and confidence in the Constabulary. Currently this Project is being managed by Team 7 of CAID as one of its activities. • To strengthen the capacity of the OC – ADHR Unit to undertake the protection and enforcement of human rights. port for a longer-term institutional arrangement for Human Rights Protection. dealt with. These complaints were dealt with under the Organic Law on the Ombudsman Commission. 4. Unpaid repatriation costs for two (2) retrenched officers. transferred to Manager Customer Operations at Head Office. The incumbent for the position was an expatriate. authority’s lack of response and unfair redundancy package offered to him. considered because there were other applicants considered more qualified than him. tion of Manager Change Management, a position higher than his previous position. isfied with his remuneration package. structure and praised the good work of the Commission for the people of Papua New Guinea. dressed their grievances to the satisfaction of both parties. Investment Promotion Authority (IPA) and the Department of Lands and Physical Planning. and government officials for any participation or benefits from the business activities. and leased to its subsidiary which was certified to carry on business in the retailing, merchandising and supermarket operations. Therefore, the subsidiary did comply with the IPA Act to operate supermarket at the company’s base. Government body or statutory authorities who are regulators to compel them to investigate and remedy the situation complained of. carry out their statutory responsibilities and be responsive to the needs and aspirations of the people of PNG. Courts (PoMDC), however for some unknown reasons the Department did not pursue the matter further. agreed to accept an offer from the CEO to procure stationary items for the Department instead of cash repayment. amount of cash advance he received. the amount is small, this case illustrates the fact that taking cash advance is not uncommon in many Government Departments. gage, transit accommodation and other personal costs involved. ant from Morobe was owed K32, 907.50.
of repatriation costs were still outstanding. the cheque processed and pay the complainants. layed the issuance of the title to the property on a certain allotment in Wewak, East Sepik Province. ruary 2006 NHC advised that the matter was referred to the Conveyance Coordinator to deal with and advise. plainant thus the case was closed. sister was on Grade 6 position and was promoted to Grade 7 in June 1999, however, her pay was not adjusted to the new position. had not been paid their back pays in line with the new salary as per their respective promotions. process the payments and pay the officers. respectively by the Department of Health which was confirmed on 01 November 2007.
live with them while she was in custody. relieved for the assistance given to her by the Commission. tock and on the head resulting in a large lump appearing on his head and he was stripped naked. the prisoner. The team anticipated seeing a badly bruised prisoner but to our surprise the prisoner appeared before us in good health. der the Public Service General Orders. disciplinary action on the officer. event of doubt as to whether a person is a person to whom the leadership code applies. The Leadership Code is therefore morally and legally binding on the Leaders and firmly enforced. made up of an Annual Statements Assessment Unit and three Investigations Units. received against the Constitutional Office holders. Statement within three months after becoming a person to which the Leadership Code applies. The table below shows the number of Annual Statements (AS) sent and received from various categories of Leaders in 2007.
the end of 2007 the status has not changed. Judge Mark Sevua was referred to the Public Prosecutor on 1 October 2004. Details of this case are reported in 2004 Annual Report. At the end of 2007 the status of this matter has not changed. Mr Gallus Yumbui was referred to the Public Prosecutor on 16 November 2004. Details of Mr Yumbui’s referral were reported in 2004. Principal Magistrate Geita) decision of 2 to 1, recommended that Mr Yumbui be dismissed from office. the Member of Parliament for Manus Open Electorate. Haiveta lost office and the Tribunal lost jurisdiction. tional Elections. Details of this referral are reported in the Ombudsman Commission Annual Report for 2006.
for Kairuku-Hiri Open electorate in the National Parliament. A full detail of the referral is reported in the 2006 Annual Report. asking the tribunal to impose the maximum penalty, the Leader through his Counsel asked for and was granted an adjournment. Mr Muingnepe was not returned as the Member for Bulolo Open in the 8th National Election. full detail of the referral is reported in the 2006 Annual Report. Prosecutor. A full detail of the referral is reported in the 2006 Annual Report. Public Prosecutor. Full details of the referral are reported in the 2006 Annual Report. for extension. A full detail of the referral is reported in the 2006 Annual Report. year 2002-2003. Mr Tomiape lost office in the 2007 National Election. • In respect of any other person, enforcement proceedings in the National Court under Section 23 of the Constitution. and issued two Directions under Section 27(4) of the Constitution which are listed below. duress to approve contracts outside the normal processes. application of the TSIRMP funds. Department of Transport was pushing for new projects which are normally handled by Department of Works. Finance, Transport and Civil Aviation, Secretary for Finance and Transport and all members of the CSTB. the Public Finances (Management) Act and any relevant tender guidelines. issue, at this stage, about the improprieties of the awarding of the contract. there was no issue with the bonus amount to be paid by MRDC. resolution of the Shareholder and MRDC Board to make such a payout. owing to him under the contract) calculated from the date of termination to the balance of the contract of employment. At the end of 2007 the Direction is still in force. In 2007 the Ombudsman Commission was involved in a number of litigation matters both in the National Court and the Supreme Court. below has a list of matters from previous years that are still pending at the end of 2007.
a leadership tribunal. Those are reported in the Chapter on the Leadership Code. validity of a law or a proposed law. any other decision of the Supreme Court (Section 19(2) Constitution). guardian of the Constitution without fear or favour. tion and within the Act. At the end of 2007 this matter was still pending. are inconsistent with the National Goals and Directive Principles. At the end of 2007 this matter was still unresolved. ter was still pending with the Supreme Court. jurisdiction of the First Defendant, the Ombudsman Commission of Papua New Guinea (hereafter “the Commission”). entities etc. At the end of 2007 the decision is still pending. the decision of the Ombudsman Commission to refer him to the Public Prosecutor on prima facie case of misconduct in office. Details of this matter was reported in 2006 Annual Report. 2007 this matter was still not resolved. Sheehan J And Injia J.
Ombudsman Commission of Papua New Guinea Jalina J, Kirriworm J.
good leadership are the final outcomes that the Ombudsman Commission pursues. Thirdly, the Constitution has also given to the Ombudsman Commission an anti-discrimination role. can be described as to improve the work of governmental bodies. ion has the same binding effect as any other decision of the Supreme Court under Section 19(2) Constitution. in the form of K10,000.00 was made to a member of the Leadership Tribunal. Direction attempts to prevent. That Members of Parliament must not access public funds contrary to set laws and guidelines. sources to purposes not intended by law. wise in breach of the Constitution, the Ombudsman Commission can challenge the constitutionality of the Act. good governance in the leaders and public institutions in PNG. filling the position left vacant by former Ombudsman Peter Masi. divisions, Leadership, Complaints and Regions and External Relations. Bougainville and the Southern Regional have been approved but are yet to be established. taken. In the Regions this is done at the three Regional Offices. were being coordinated jointly by the office of the then Director Operations and the Media Unit on an ad hoc basis. the roles and functions of the Ombudsman Commission. Bodies to improve their work. The Commission conducted a number of GBLP visits to the Provinces as well as to a number of Government Bodies in the year. ment had its own system of handling complaints and a disciplinary committee that was responsible for dealing with internal matters. The Department assured the Commission during this visit that more emphasis was being placed on helping staff. complaints to appropriate investigation Units for investigations and reporting. The table below shows the number of complaints lodged and processed in 2007.
ment of Finance had requested for the original documents from the complainant so that his case could be examined. sion and a referral letter or notice was sent to the PNGDF. On pay number 10 of 2007 he was paid his final entitlements of K5,700.00. welfare and livelihood after the passing away of his son. He became a guardian and the trustee of his grand children. then sought assistance from the Commission. K33,149.70 was raised and paid to him accordingly. Senior Investigator and an Investigator. two and a half months under the current Twinning Program between OCPNG and the Commonwealth Ombudsman of Australia. ber when Mr Virobo returned from Australia. Despite the staffing setbacks the office continued to operate satisfactorily. The following are some complaints that were lodged with the Momase Regional Office in 2007 which were successfully dealt with. were unsuccessful and he approached the Ombudsman Commission’s Momase Regional Office on 07 of May 2007.
cheque for two years and nothing happened but once our letter was written he was paid K6,056.44 as his final retrenchment benefits. He also wrote a small note to thank the Commission for our assistance. The complaint was resolved in less than two weeks. school, she taught at various schools in and around Madang Province. travelled to Port Moresby to seek assistance from TSC however; this also did not result in anything positive. 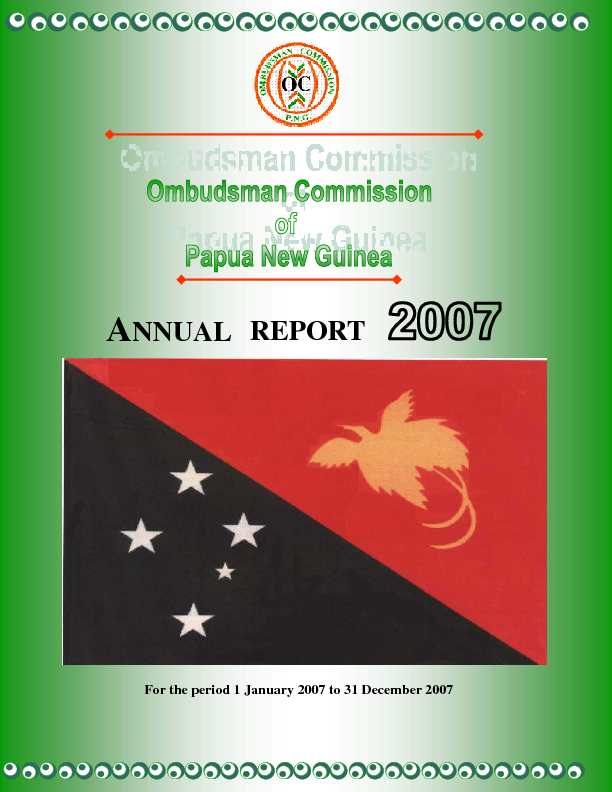 The complainant decided to seek Ombudsman Commission assistance when we were in Madang conducting a provincial trip in 2007. Upon our return to Regional Office in Lae we wrote to the Provincial Program Advisor (PPA) Madang to attend to the complaint. justed to K13,050 per annum and back pays done. was resolved to the satisfaction of the complainant. Manager with Two Senior Investigators, an Investigator, an Assistant Investigator and a Driver/Security Officer. During the year the office operated without a Senior Investigator and an Investigator after the Investigator transferred to Lae. office did perform up to expectation and continues to do so. the slow process of recruiting new officers to fill the vacant positions. appointed to fill in the position of the Assistant Investigator who was on suspension. The following are some complaints that were lodged with the NGI Regional Office in 2007 which were successfully dealt with. 1. Palmalmal Guards and Security Services. Rabaul District Council of Women’s office. They were engaged commencing on the 9 May 2007.
pany was K17,096.00 for the eight months. Rabaul District Administration and spoke to the Officer In Charge of Community Development at the Rabaul District. nessed by our officers. The outstanding balance of K1,096 was to be paid to the company towards the end of January 2008. 2. Three Public Servants fight for justice. unattached officers and retrenched. They were never paid their leave entitlements and other entitlements from 1988 up to 2007.
sion made an enquiry with the Office of Bougainville Affairs in Port Moresby and a letter was written to the said office on the matter. fairs to pay them their long outstanding dues. Ussino-Bundi. Appeal by the Public Prosecutor is pending. 51 ANDERSON AGIRU MP; Governor, Southern Highlands Province 2001 Guilty – dismissed – judicial reviews unsuccessful. 67 MARK WANI Auditor-General 2003 Guilty –Judicial Review on payment of entitlements successful. as at 2 March 2007. 75 PUKA TEMU MP, Minister for Lands & Physical Plan- 2005 Guilty of 4 out of 6 allegations. Fine of K1000 each. dismissal as at 20 December 2006. 78 CHRIS HAIVETA MP, Governor of Gulf Province 2006 Pending. 82 SIR MOI AVEI MP, Deputy Prime Minister and Minister 2006 Presently before a Leadership Tribunal. February 1983 Formal enquiry into the cause of student unrest at the University of Papua New Guinea. February 1986 Report upon an investigation into the treatment of Juvenile Offenders. New Guinea Defence Force – Leo Nuia No. 455 of 1991. December 1992 Report of an investigation into the Spring Garden Road Poreporena Freeway Project. June 1994 Report of an investigation into the Disciplined Forces Institutional Housing Project. Fund Board and associates transactions and arrangements. by the Independent State of Papua New Guinea. OMBUDSMAN COMMISSION’S GOVERNMENTAL BODIES LIAISON PROGRAM.